When a bride chooses which lucky women are going to accompany her at the front of the ceremony on her big day, she selects the ladies that she cares about and treasures the most. The relationship with each of them is unique and has a different story behind it, and it is always interesting to hear about how she met each girl and how their friendship bloomed into what it is today. These girls are the bride’s support team and are in charge of making sure that she is happy and ready to walk down the aisle. 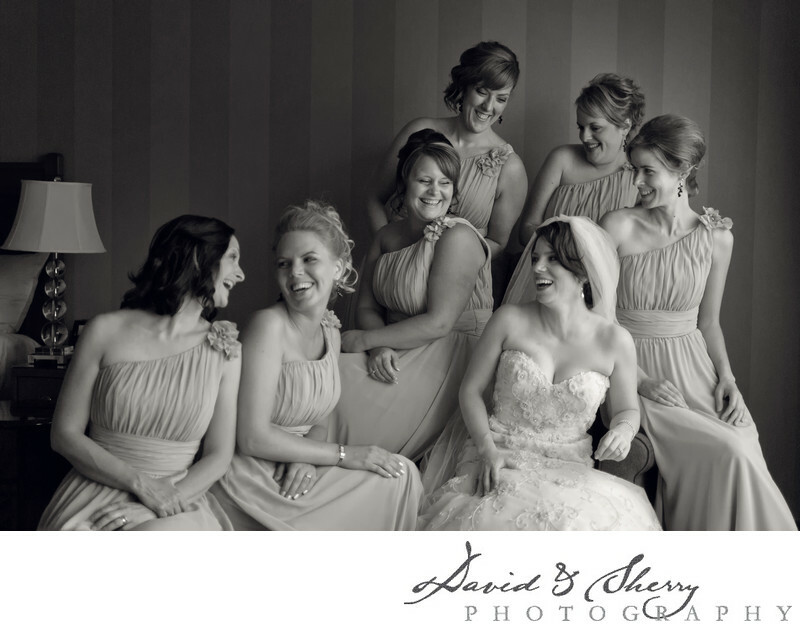 Capturing each bridesmaid’s personality and relationship with the bride makes for a great shot every time. I always encourage the girls to laugh and talk amongst themselves while I am shooting, in order to get a candid shot rather than a posed, forced one. (Yes, sometimes I do suggest fake laughter, but that always turns into the real thing.) I love this group bridal shot because everyone has a genuine smile on their face and appears to be having a fabulous time before they walk down the aisle. Although the dresses were a beautiful shade of pink, I chose to edit this in black and white in order to highlight the emotion of the image.